Posted by Summer is coming, and besides the sunshine, warmth, sports and fresh summer fruits, I love potato salads! There's a bazillion ways to make it... with roasted, boiled, leftover, mashed, cubed, smashed... and a multitude of ingredients you can add to it to make it your own. 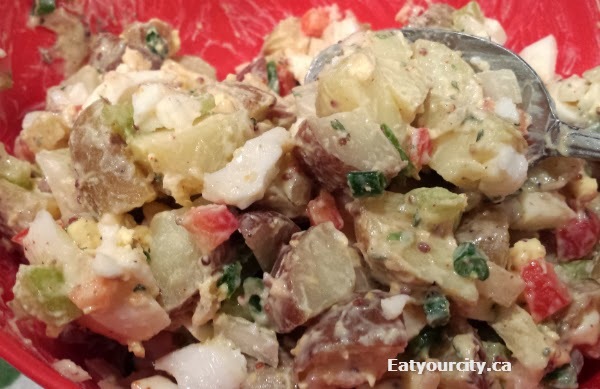 Here's a basic recipe that with your touches, will be a fab potato salad your family and friends can enjoy. -3-4 hard boiled eggs, peeled and chopped up. Here's how to hard boil and peel eggs perfectly! 1) If roasting the potatoes: Keep potatoes whole and wrap in foil and bake in 275-350F oven for 2 hours or until soft in the centre. Cool, then slice baby potatoes in half or cube potatoes to 3/4 inch cubes if using large potatoes. If boiling the potatoes: Slice the baby potatoes in half or cube potatoes to 3/4 inch cubes if using large potatoes. Bring to boil a medium pot of water filled up half way with water - add in 1 teaspoon of salt and then add in potatoes. Boil potatoes for 8-10 minutes or until fork tender. Drain well and cool. 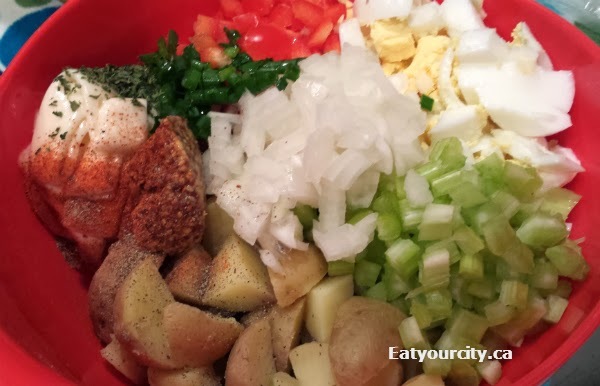 2) Assemble ingredients in a large bowl. Mix everything well, season to taste and chill. Enjoy!